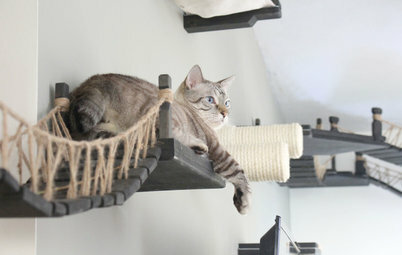 Whether they’re underwater divers for the Los Angeles Police Department or full-time caregivers for a local zoo’s tiger cubs, the grandparents of Houzz have led some pretty exciting lives. To celebrate National Grandparents Day on Sept. 10, we asked you to share favorite photos and stories about the people at the head of your family. For all the adventure and unique storylines you shared about your grandparents, there was one common thread that tied the more than 100 photos and stories together: your grandparents’ love for life, family and home. Let’s take a look at some of our favorites. 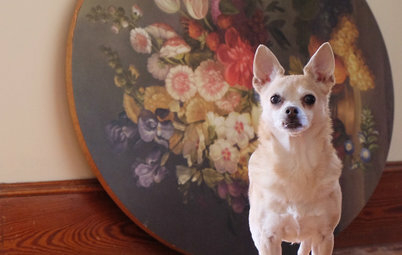 “I love so many of my Mamaw and Pop’s photos,” Erin Timberlake says. 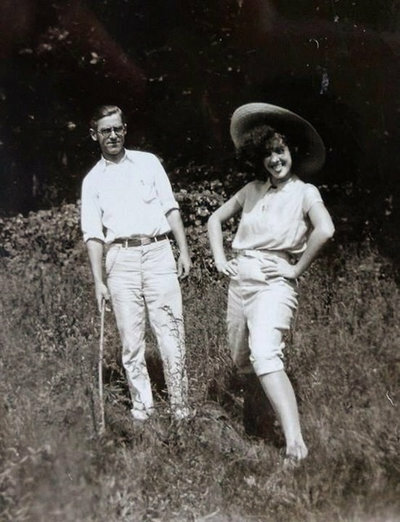 “They married young, and their love lasted until death.” This photo, taken in the summer of 1928, shows her grandparents in New Albany, Indiana, most likely in their backyard. 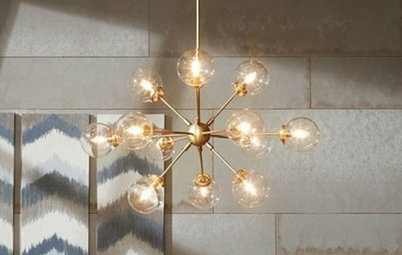 “It sure does show what a hoot my artist grandmother was and how handsome my grandfather was,” Timberlake says. “Pappy was a charmer, and Granny a beauty,” Christel Shuckburgh says. “Some of my favorite memories are of them sitting in the family room, looking out at the Shuswap Lake and having happy hour at 4 p.m.” This family photo was taken in Pump Hill, in Calgary, Alberta, while it was still farmland. 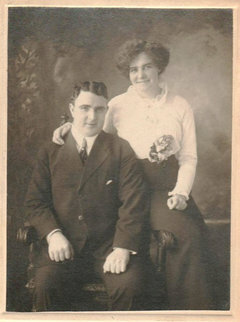 “The photo features my grandmother Billie Coppinger, my grandfather Doyle Coppinger and mother, Sandra Coppinger,” Michael Powell says. This photo was taken on Easter Sunday in 1961 in Fort Oglethorpe, Georgia. 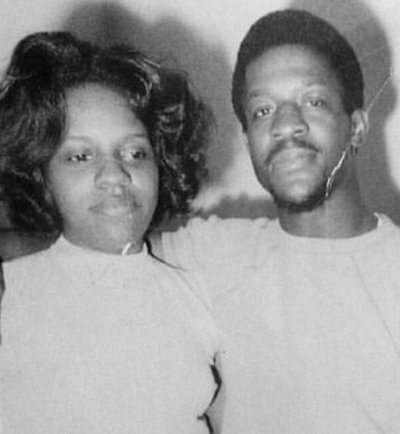 “In this photo, we see my paternal grandparents, Linda and Joseph Robinson,” Ashley Robinson says. This photo was taken in Arkansas in 1963, soon after her grandparents’ wedding. This was an important year for them, Robinson says, as they uprooted their lives from the South to move north to Detroit. “You can almost see the youthful ambition and drive in them,” she says. 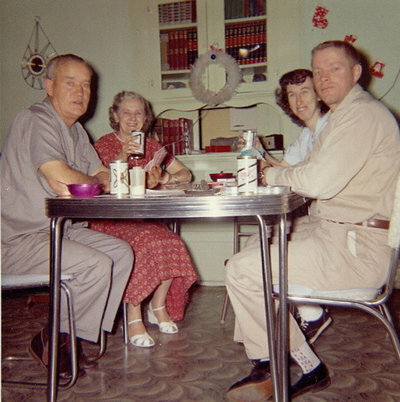 “This is a photo of my grandparents from the late 1950s. They were both police officers and were instrumental in forming the Underwater Search and Rescue team for the LAPD,” Kasey Spangler says. 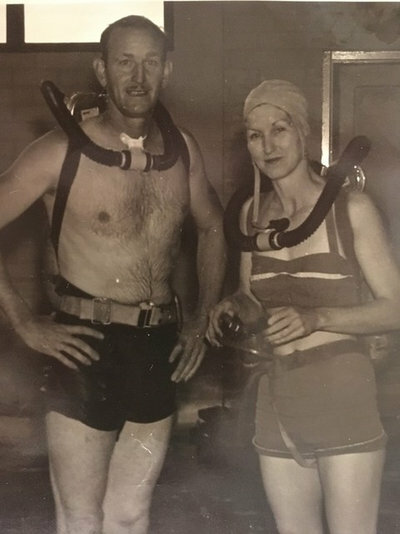 “They didn’t have ready-made wetsuits back then, so they used to have a pattern and would cut them out on the kitchen floor and then use special glue on all the seams.” This photo shows Chloe and Morris “Gil” Gilmore in the garage of their home in San Pedro, California. 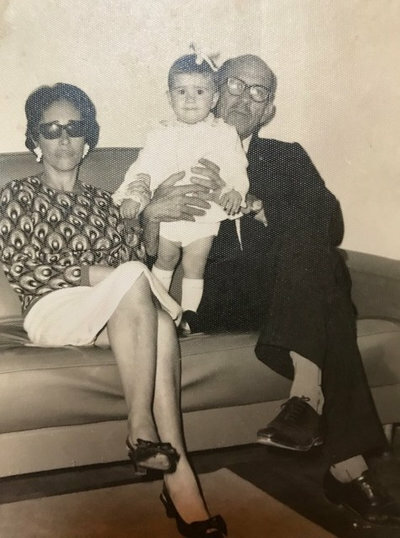 “These are my grandparents Carmelia França and Sylvio França with me at their apartment in Rio de Janeiro,” Ana Graneiro says. This photo was taken in 1966, and the family was celebrating Graneiro’s first birthday. 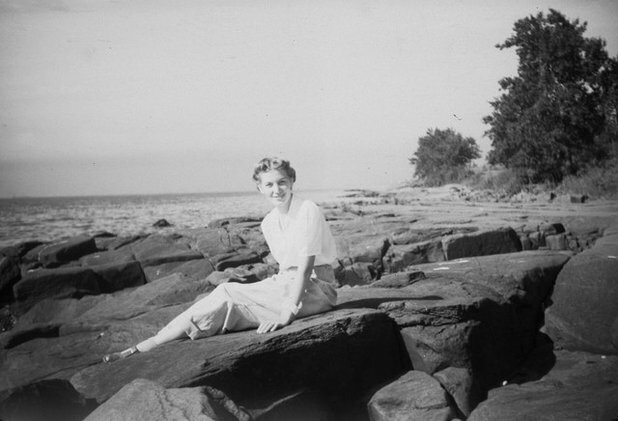 “Grandma She,” as she was called by her grandchildren, briefly modeled and worked as a studio page before getting married at age 19. 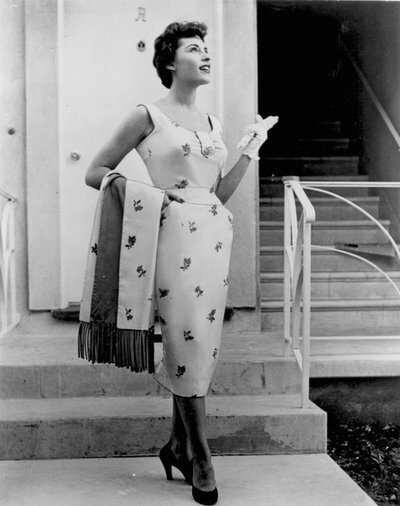 This photo shows her outside an L.A. apartment building in the 1950s. “She was a very funny and silly lady. She laughed a lot, and sometimes at her own expense. 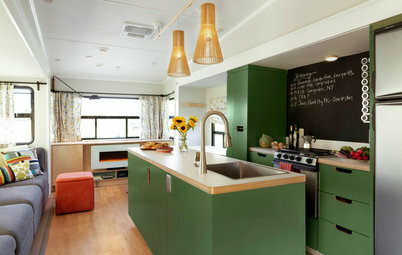 She was easygoing about most things, but she liked a neat home and good manicure,” says Houzz user sparrowa. 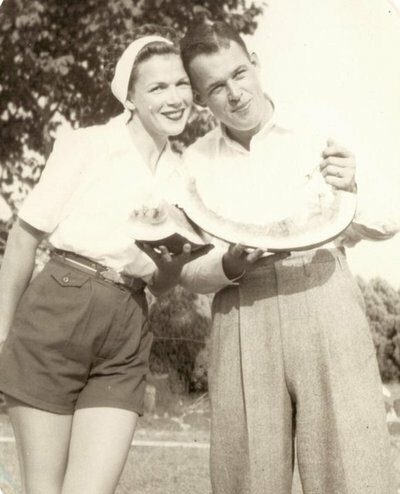 This photo was taken in 1946 near Austin, Texas, outside the couple’s home at Bergstrom Air Force Base. 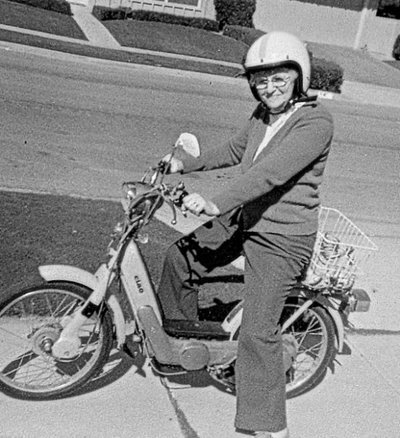 “This is my Grandma Bock, sitting astride my cousin’s moped,” Gail Dalmat says of her Danish grandmother. “This was probably in front of my Aunt Carol’s house in Orange County, California,” she adds, most likely in the early 1970s. “Her husband was a chemical engineer. During WWII, he brought home some liquid sweetener (sugar was being rationed) so they could make their regular batch of root beer. It was curing in the cellar when the bottles began to explode (probably the sweetener fermented differently than beet or cane sugar),” Dalmat says. Using a broom and a window screen, Grandma Bock broke the rest of bottles with the broom to prevent more explosions. 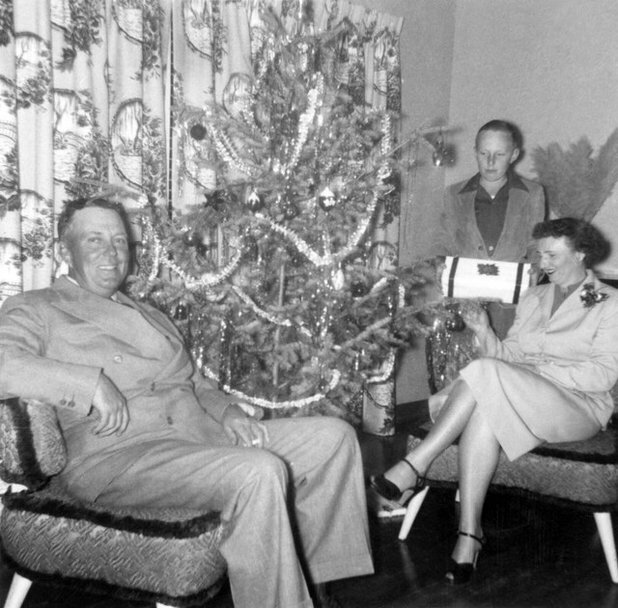 Shown here in the 1940s around Christmas, Ginger DeBrosse’s grandparents and her dad are relaxing at home in Miles, Texas, a small farming community outside San Angelo, Texas. 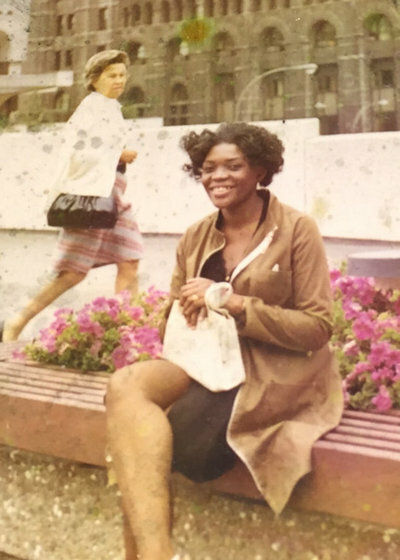 “What I do remember about my grandfather is that he was always smiling and laughing and enjoying life, as he seems to be in this photo,” she says. 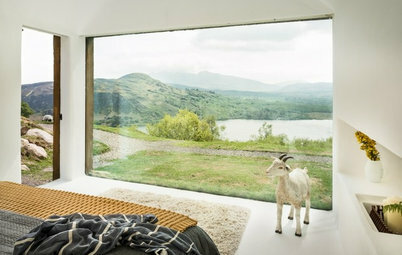 “Grandpa Adrian built the house by hand,” says Adrienne Shanafelt of the Portland, Oregon, home we see here. 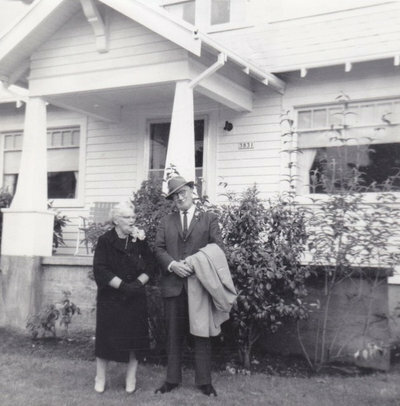 “He first built a detached garage, which they lived in until they moved into the completed house in about 1925.” Here we see them standing in front of that house in 1967, commemorating their 50th wedding anniversary. “I still wonder what he said to elicit that expression from her,” she says. “These are my grandparents Grace and Edward Barsness with my mother, Joyce, Aunt Joanne and Uncle Ed,” Janet Shockley says. 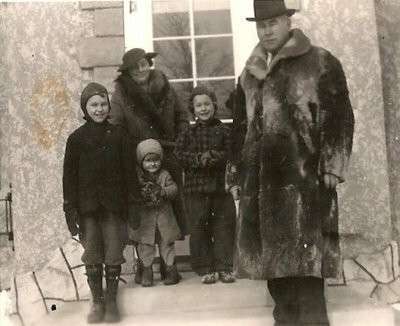 This photo was taken in the late 1930s on the front steps of their home in Glenwood, Minnesota. They built this home in the early 1930s, customizing the kitchen to accommodate Shockley’s grandmother, who was under 5 feet tall. “My Grandpa was 6 feet 2, but he never cooked or did dishes, so it didn’t matter. 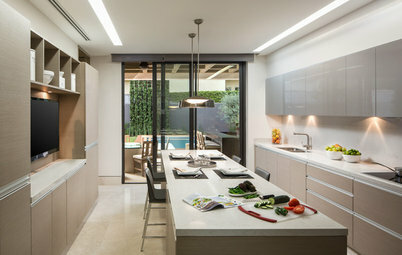 It was a magical kitchen for us as grandchildren, as everything was more sized to us,” she says. “Grandpa always had plants growing in the house,” Linda Renslear says. “My grandparents loved to play cards,” Gwen Hathaway says. 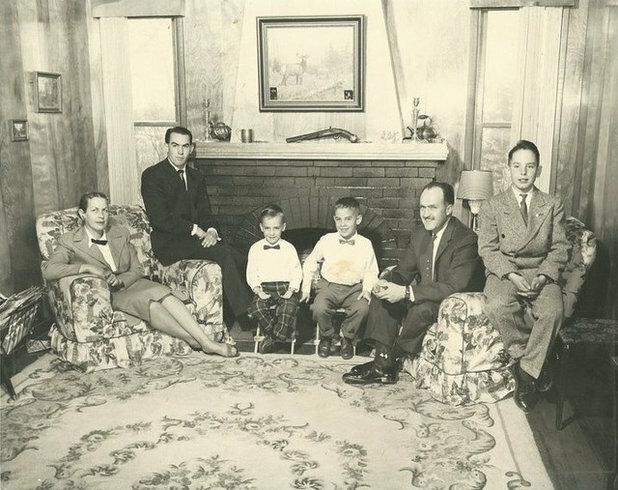 Here they’re playing with Hathaway’s parents in December 1961, when Hathaway’s parents were renting an old Victorian home in Roseville, California. 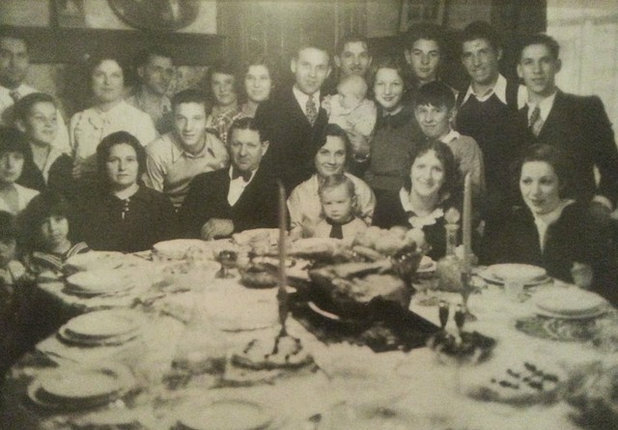 Here Dolly DiCarolis’ grandfather (standing with a baby) and grandmother (seated with a baby) are celebrating Thanksgiving 1935 in Oakland, California, with her grandfather’s extended family (he was one of 11 children). After emigrating from Portugal, “they settled in Massachusetts before being run out of the state by the Feds for making and running moonshine,” she says. From there they moved to California. 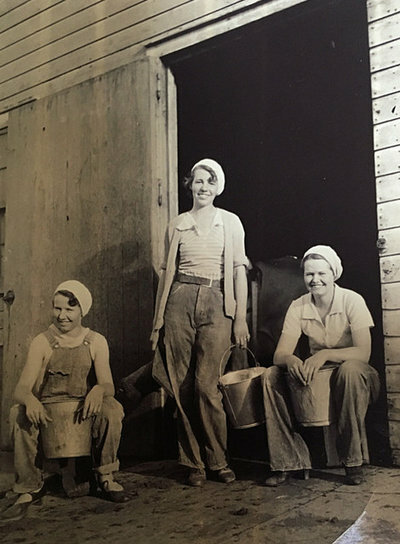 This photograph from 1935 shows Houzz user juke66’s grandmother (on the right) and her sisters on their family farm near Glenorado, Minnesota. “What I love about this picture is how beautiful they are, even in their work duds. I also get a kick out of the shoes my grandma is wearing — high heels. They are really styling,” juke66 says. 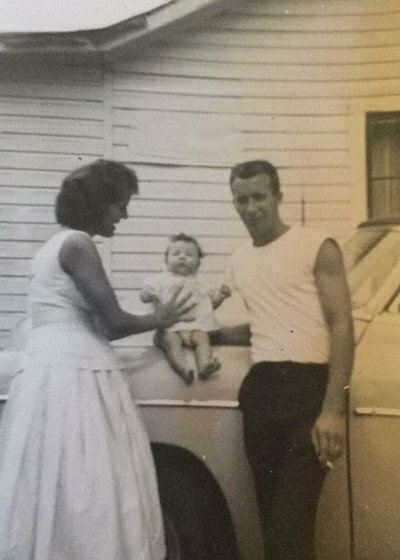 Laurie Tatlock’s grandfather Merle Aylard is shown here with her mom and uncle, Peggy and Jimmy. 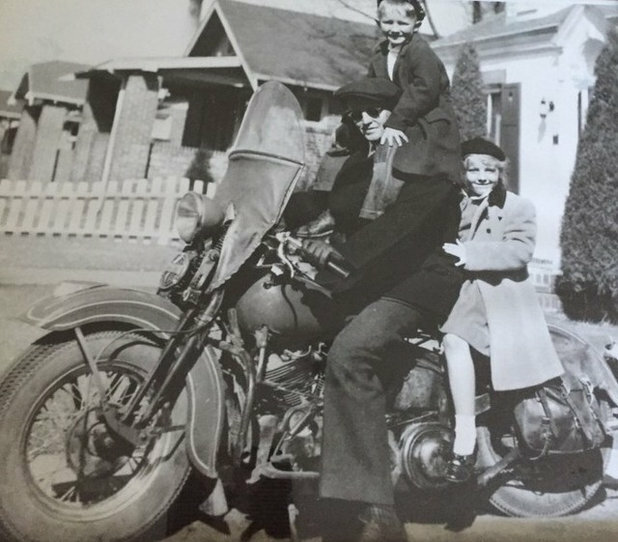 “He was a pharmacist and during WWII made drugstore deliveries on a Harley,” Tatlock says. This photo was taken during the war in front of her grandparents’ home in Denver. “Both of my grandparents were fun people, loved each other deeply, and could party hard,” she says. 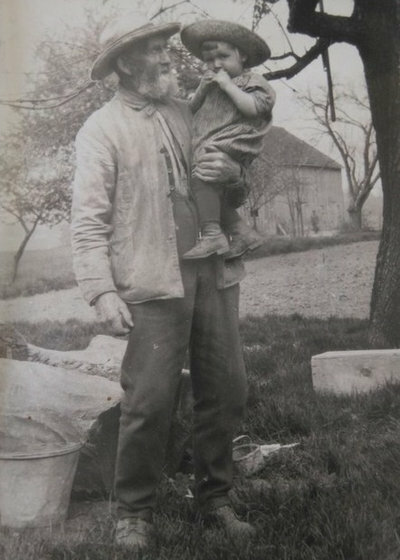 “This is a photo of my father and his grandfather circa 1920. 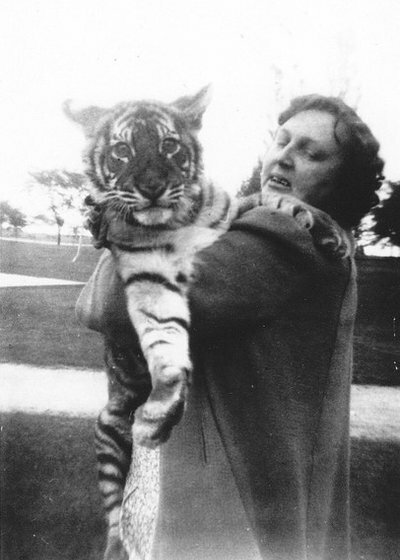 It was probably taken with a box camera,” Andrea Jones says. “My favorite part is the expression of enormous pride and love on the face of my grandfather as he looks at his first grandson.” This photo was taken in St. Thomas, Ontario. 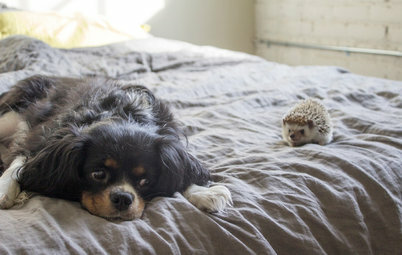 I had to include a photo from my family. 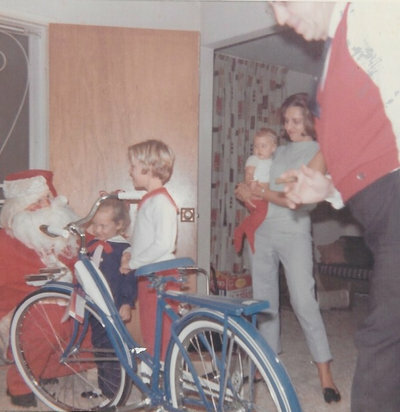 Here we see my grandma, holding my aunt, with my mom and other aunt talking to Santa Claus (my grandpa dressed up). I wonder if they were fooled. This photo is from the early 1960s and was taken in San Diego, California. “My grandfather had an amazing sense of humor, and I can feel him hamming it up for the camera,” Eydie Jackson says. 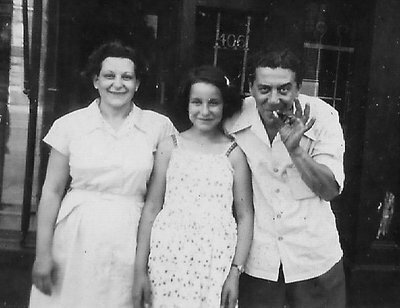 “I see my grandmother and mother trying to keep a straight face.” This photo was taken in 1949 on the front porch of Jackson’s great-grandmother’s house in downtown Toronto. “My fun-loving grandparents (and my mother, if you look closely at my grandmother’s tummy),” Annie McGinn says. 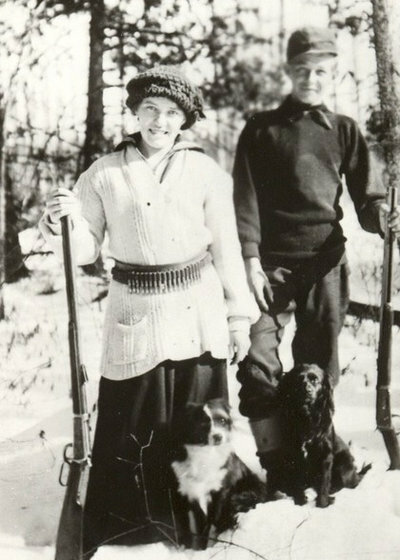 Here Raemonda and Mike Bosak are standing in front of Mike’s parent’s farmhouse in Barnesville, Minnesota, in the summer of 1943. “My grandmother was such a lady. 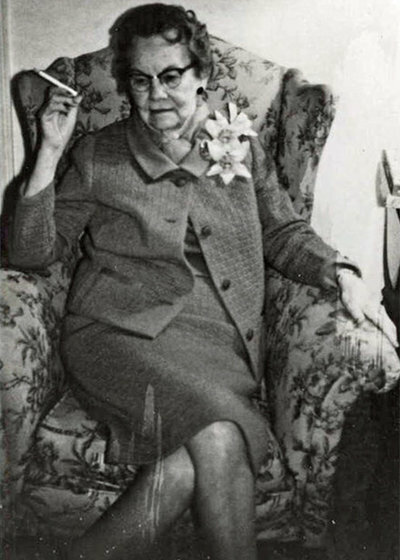 She had furs, pearls and perfumes, which I loved to play in,” says Rachelle Jackson of her grandma, shown here in 1967. “She would shop at all the NYC department stores,” such as Lord & Taylor, Bloomingdale’s, Macy’s and Alexander’s. 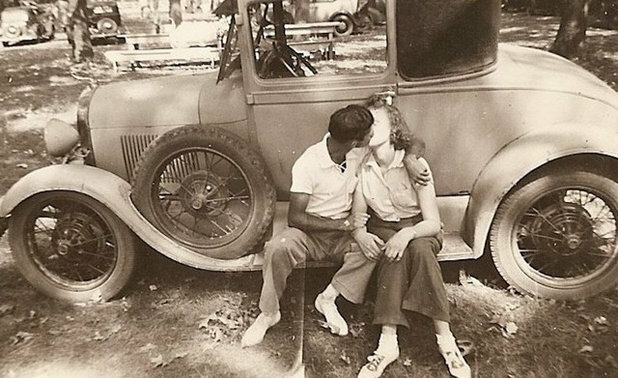 This is Harold and Arline Marti in 1940 in front of the family car on their family farm in Davenport, Iowa. 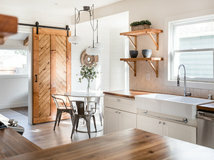 “After they were married, they lived at the farm until they were able to purchase their own home in Davenport,” says Kimberly Grell Eaker. “I remember him leaning over to kiss my grandmother that same way many, many times,” she says. Rather than a grandmother, the woman in the center is actually my GREAT grandmother: Mary Luetta (Gick) Payne (1868-1954). 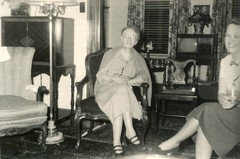 She was born not long after the Civil War and lived into the age of (early, tiny-screen, wood-cabinet) television. 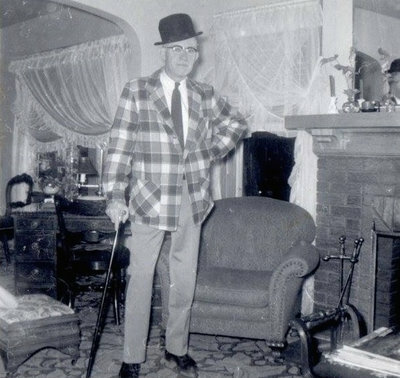 This was probably taken a year or two on either side of 1950. 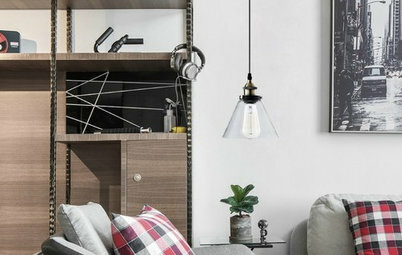 As for this room interior, it seems to run counter to all of today's rules against heavy brown furniture and window coverings. Reading this article was fun. 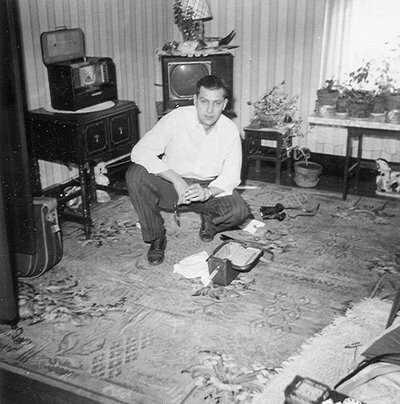 My grandparents passed away before I got to know them And all the pictures either one of them took, were horded by other relatives who swore they didn't have them. I have an obituary picture of my grandfather. But my mother said little about him because she thought he had something to do with her mother dying early in life. I've often wondered what it would have been like to have know either of them. These stories made me smile and they made me sad. But the smile was worth it. Thanks. This should be done more often. 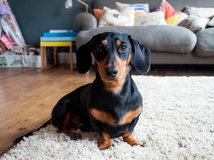 I loved this article! I am the custodian of my family's photos since my Mom passed on, so these all warmed my heart. 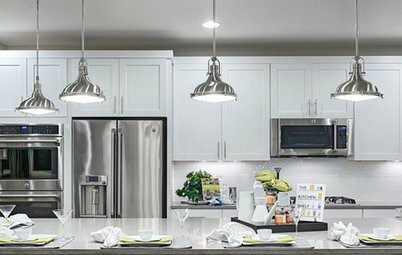 I love looking through our photos and make sure to pass them along to other family members. My brother had been estranged from the family for 40 years and when we got back in touch, I made a photo album of all the pictures I had of him so his lovely wife could enjoy them, too. 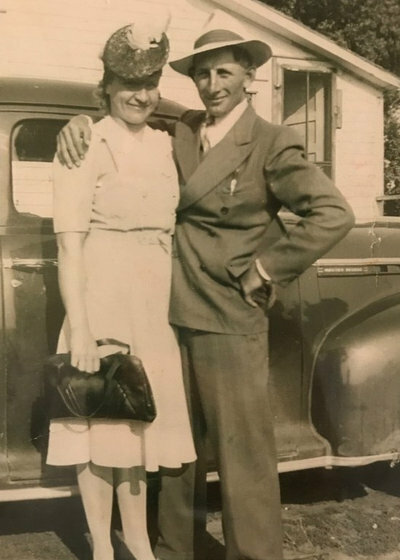 The photos below are my maternal Grandparents: he, a singing waiter, died before my Mom was even born and Grandmother, a seamstress, died when Mom was 5 years old. When my Mom passed, I wasn't too sad, as I envisioned a family reunion up there. 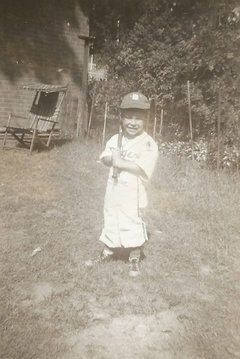 The 2nd photo is my brother when he was just 3 years old in our backyard in Queens, NY. In addition, I have received many photos from my cousin, who I had not seen in many years. She lives in another state and whenever she comes across a photo, she sends me a copy along with some more memories. She knows a lot more about my adopted Granny than I do because she, her parents and her brother lived with her. So glad to be able to share all the memories from the article, I truly enjoyed it!